I love any excuse to make pies. I try not to make them on a regular basis for obvious reasons, but after I realized that it’s 3.14, I figured I’d make Indian food for dinner tomorrow and whip up some pies for tonight. 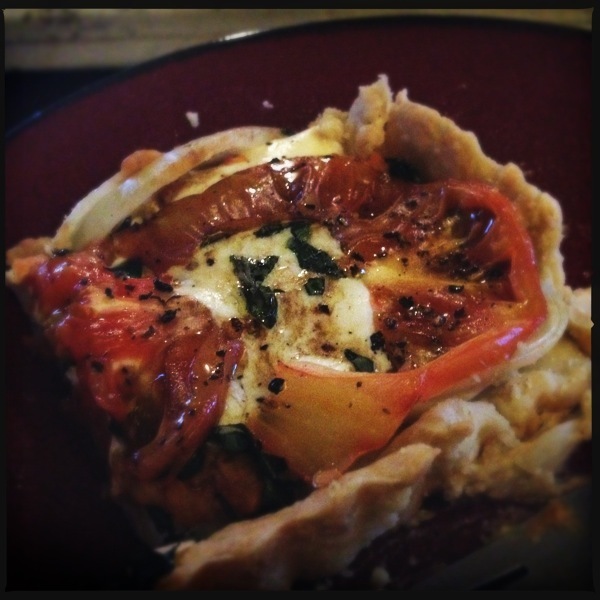 And I took pictures to, you know, see how I am at blogging about cooking. 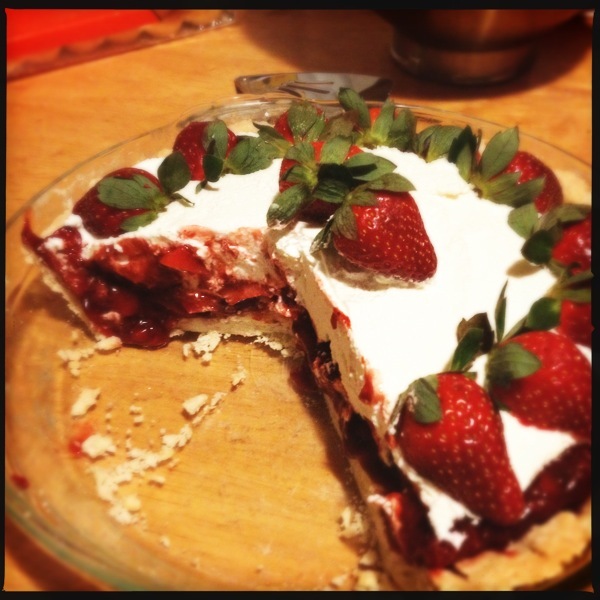 For dinner, we had salad and a tomato onion tart (pie…tart…same difference), and for dessert I made strawberry shortcake pie because they have strawberries for $0.69 at Aldi. I used recipes for the pie crusts, but made up the rest of the pies as I went — and both were delicious!! 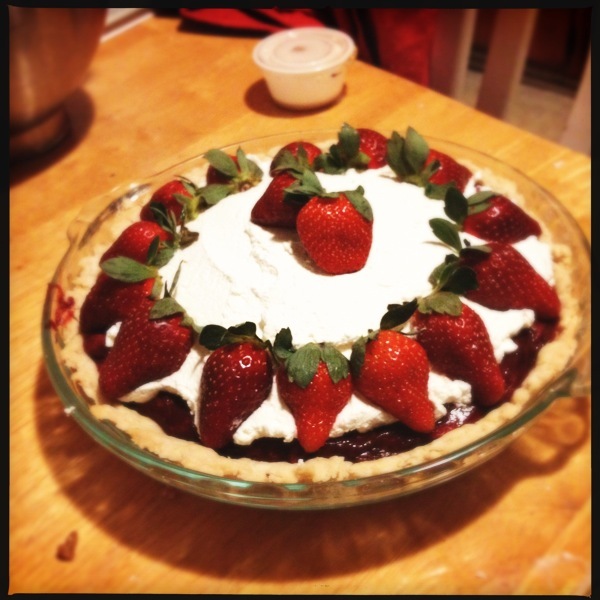 To make the strawberry pie, which I did first, I cut about a quart of strawberries and used a potato masher to mash them while I heated them on the stove. 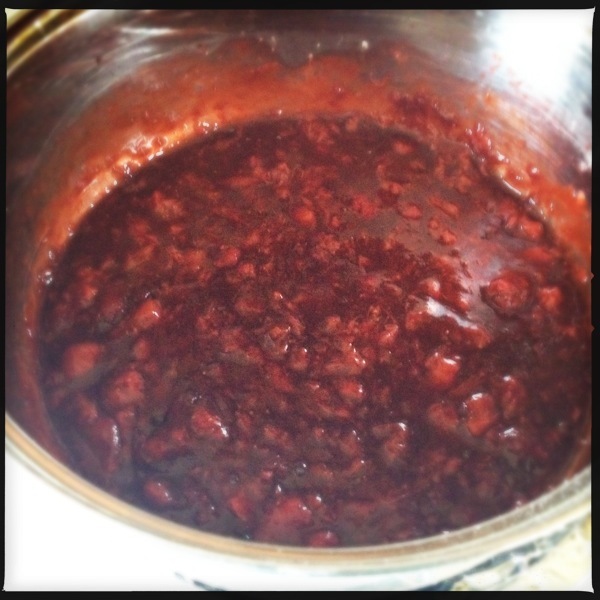 To the strawberry puree I added balsamic vinegar, a little honey, cornstarch, and a pinch of salt. I simmered it for a bit until I could tell that the cornstarch was in there, then took it off the heat and let it cool a bit. Meanwhile, I baked the pie crust. I used one of Martha’s recipes, obviously, because they’re the best. I’d like to have a food processor for making pie crust, since everything is supposed to be as cold as possible, but since I don’t have one I just use my hands and cut the butter into small pieces. Seems to work fine, though I haven’t ever made a pie crust using a food processor so I can’t really compare. You can see the tart pan underneath the pie pan. Multitasking! 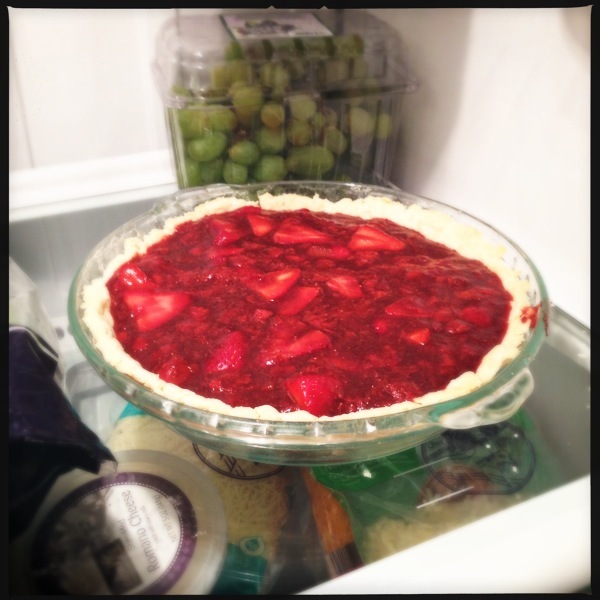 Once the pie crust was finished, I put the strawberry filling in and let it cool for a while in the fridge. While it was cooling, I put the tart together — sweet potato medallions on top of a layer of sliced onion. I baked the sweet potato first, but didn’t cook the onions at all (which resulted in some extra crunch). I sliced a ball of fresh mozzarella and put that on top of the sweet potatoes, and chopped up some fresh basil to sprinkle on top of the mozzarella. (Lots of basil.) 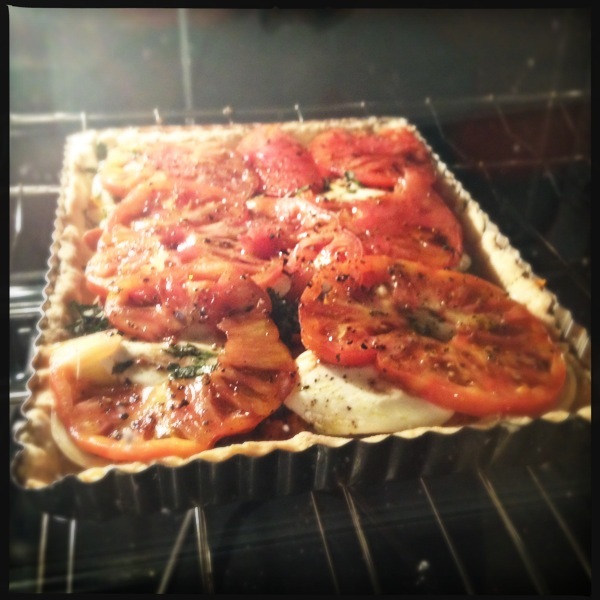 Topped it off with sliced tomato, salt and pepper, olive oil, and a somewhat sprinkling of balsamic vinegar, and then baked it for about 10 minutes until the cheese melted. It was SOOOO GOOOOOD. I mean, it was really good. The only thing was that the crust ended up being soggy because of the oil and vinegar, plus the mozzarella and tomatoes are very wet. I dried them between some paper towels before putting them on the tart, but I guess that wasn’t enough. HOWEVER, I ended up kind of liking the sogginess. But when I make it again I’ll probably try to avoid that. I whipped some cream after we finished the tart, and added honey and vanilla to it. Here’s the finished pie! 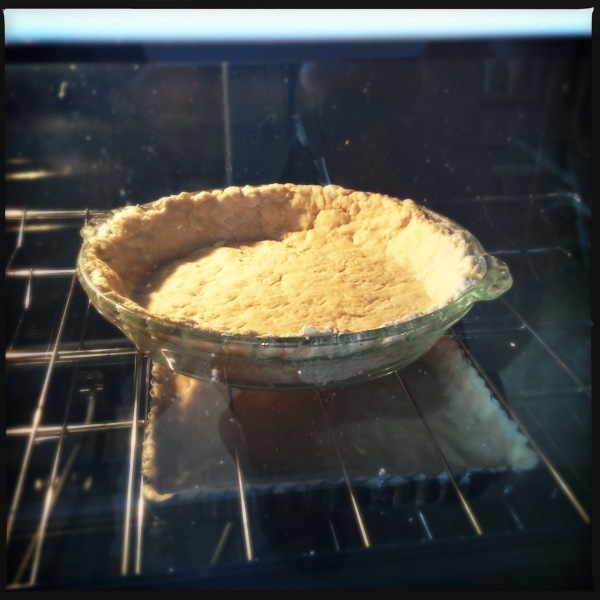 Again, I know I said this before and probably shouldn’t again, but the only recipes I used were for the pie crusts. 🙂 Just saying. It’s okay to brag on my own blog, right? Especially since the only people who will see this I would brag to anyway. I forgot to mention that I put a layer of lady fingers on top of the pie crust, and poured the strawberry compote (I guess that’s what it was, right?) over the lady fingers. I wanted it to be more strawberry shortcake inspired than strawberry pie inspired. And now it’s 8:00 and the kitchen is a mess, and I’m too full to clean up. Meh, there’s always tomorrow!